IT'S MY FIRST ORDER - WHAT DO I HAVE TO DO? BUT if you’re living outside the EU, just write us an Emali & we’ll check what we can do. We’re known for making the impossible possible. As long as you’re living on this planet, there’s always a possiblity. Buckl-Promise! //Do I have to register with you to order? No, all you have to do is enter your contact details at the end of the order process so we’re able to send you your Hunnsbuckl. Creating an account is not necessary. //Can I buy your products in other shops too? Currently there are only a few stores in Germany where you can adopt one of our Hunnsbuckls. So if you’re living in another country your only option is ordering them right here at our onlinestore. But we’ll add retailers abroad as soon as possible. OK, WHAT ABOUT THE PAYMENT-STUFF? HOW DO I PAY? //What kind of payment methods do you accept? You can pay by bank transfer or PayPal & will add Creditcards to the payments next year. // How much time do I have to pay after the purchase? If you have decided to pay in advance (bank transfer), you have 10 days from the conclusion of the contract to transfer the outstanding amount to our account. If you have not transferred the payment within 14 days, you will automatically receive a payment reminder & after another 7 days you will receive a last reminder. After another 7 days your order will be cancelled automatically. As for PayPal you’ll get forwarded to their site & do your payments immediately after purchasing. //What about the shipping costs? The costs will be displayed at the checkout before you place your order. We try to limit them as much as possible. //How long do I have to wait for my order - approximately? We always try to send your orders as soon as possible. At times of strikes this cannot be guaranteed, but your order should be in your postbox within 5-10 working days after receipt of payment on our account. Please keep in mind that it can always take a little longer around holidays. // Which service provider are the products shipped with? All parcels and packages are sent by DHL or Deutsche Post. // Will there be a tracking number? If your order is that large that it needs a package to come to you, yes. As soon as your order is on its way to you, you will receive an email from us with the tracking number so that you always know where your package is. // I do not receive my order, but I have already paid for it. What is the reason for this? If you have indicated prepayment with bank transfer as your payment method, you should know that we will only process your order once we have received the outstanding amount. This process takes different lengths of time from bank to bank. Be sure we’ll send your order as soon as possible. Unfortunately, there are occasional problems and abortions with payments via PayPal. So please check first if your transfer has been debited to your account via PayPal. Then you should check again if you have chosen PayPal as your payment method during the check-out, because if not, you cannot pay for the order via PayPal. Payment via PayPal is, of course, only possible with an appropriate PayPal account. In general, you may also have chosen a product that has a longer delivery time (e. g. if it is out of stock or similar) & your order will only be shipped when all products in your order are in stock. The delivery time of a product will be shown in the overview for each product (it’s shown in days/Tage). Just send us a message if there is anything left uncovered up here & we'll see what we can do for you & check what could have happened. I AM INTERESTED IN A SPECIFIC PRODUCT. HELP ME OUT – PLEEEASE! // I have a question about a very special product, where can I ask? Check the description again to see if your question can be answered there. Otherwise, you can contact us via the shop's contact form. We will try our best to answer your question promptly. Note: Please do not reply to order confirmations, but use the contact forms! // Is that special product also available in other colours? All our products in the onlineshop are available in the colours shown only. // I don't get an answer to my Mail! In general, we always try to clarify all questions as soon as possible, but sometimes something goes down or the Hunnsbuckl caused a chaos or wants to be crawled or or or or or or or. Please also check if there is a mail from us in your spam folder - some programs don't like our name & consider it to be unwanted advertising. A cheek! If there is nothing there, you could also check in your folder under "sent" to see if your mail has really gone out (sometimes an email just hangs on its sender & doesn't want to go the long way) & was addressed to the correct mail address. Please note that we are not 24 hours, non-stop in the studio and only a woman & a plush cuddly mountain are available as a contact person. It sometimes takes a moment longer, but we try hard. I WOULD LIKE TO KNOW MORE ABOUT YOU! //I want to know more about you, especially the Hunnsbuckl! You’ll get a lot of infos about him & his story e.g. in his Interview. // I want to buy THE Hunnsbuckl! The Hunnsbuckl on our photos on Facebook, Instagram, Youtube & the Homepage is NOT for sale. It is definitely not for sale, no matter what amount you offer (& there was a lot of stuff there). The small (plush) Hunnsbuckl that lives in a small basket in our studio is the origin of our label, source of inspiration & an important part or inhabitant of the studio. I have sewn, stitched, formed and stuffed it by hand & in the past few years it has been filled with life & that alone would make him invaluable. An absolute unique specimen! The little guy is a family member that you can't sell even if it's curious, moody & stubborn. // I would like to use the Hunnsbuckl for my products. May I do that? Quite clearly NO! The Hunnsbuckl & all the designs including illustrations are protected by copyright. 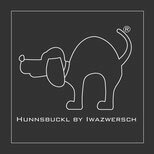 In addition, the "Hunnsbuckl" is a registered trademark of the DPMA (German Patent and Trademark Office, Munich) & thus protected. Any use or processing without written permission or license is expressly prohibited! We reserve the right to take legal action in the event of non-compliance. // I run a blog / work for a newspaper and would like to report about you. What do I have to do? We are always thrilled to be introduced with our idea & designs. Do you need more information, photos, resolution requests etc.? No problem. Just send us a short message how we can get back to you, if necessary also some specific infos that you’re interested in. We’re going to provide you with all the information you need. // I have a shop & would like to add your designs to my assortment, is that possible? If you are interested in offering the Hunnsbuckl a spot on a shelf & you can imagine that your customers like him, just send us a message via one of the contact forms Shop or Homepage (please with some information about your business or the concept & maybe already with specific details about the designs you are interested in) & we will get in touch with you as soon as possible. Buckl-Promise! // Who is "WE" & who is behind the shop & the label? In this case "we" are the designer & owner of the label Melanie Roeper-Mohr & der Hunnsbuckl. Everything you see is done by a woman and a plush Hunnsbuckl. Honestly & without cheating. "We" are the complete team & responsible for everything that arises in the studio, in the WWW, Facebook, Instagram etc. // Speaking of social media! You can find us on Facebook , on Instagram & at Youtube. You'll regularly get updates & news out of our studio, about new products, travels & the adventures of the Hunnsbuckl. Feel free to drop by and say hello. We are always happy to meet new people.